Slovenia’s beer war re-emerges with a vengeance. LJUBLJANA, Slovenia--In Slovenia, some things are decided for you just by being born in a certain region: your dialect, your sports teams--and, importantly, your beer. Slovenian beer drinkers are by no means generic. They fall into one of two drinking camps: Lasko or Union, the country’s two major breweries, each with set of loyal fans, invariably divided along regional lines. Drink the wrong beer in the wrong region, and strange and mysterious things could happen to you. Until last summer, in Slovenia “beer war” referred to bar brawls and nasty jokes exchanged between members of the two allegiances. But after the Lasko brewery began to actively explore possibilities of taking over Union last year, the term took on quite another meaning. The battle began with a bang, then slowly disappeared over the winter months from the front pages of Slovenian newspapers. Indeed, nothing stirred the suspenseful silence that followed the initial scuffle until the beer war’s latent emotions returned with a vengeance over the past two weeks. The story has all the elements of cheap drama: the bully (Lasko), the damsel in distress (Union), and the knight in shining armor with ulterior motives (the Belgian brewery conglomerate Interbrew). It all began in June 2001 when Lasko--the largest Slovenian brewery, with a 54 percent market share--purchased 25 percent of shares in Union brewery. At the time, assurances were many that there were no takeover plans in the air; just innocent plans to strengthen both breweries for a healthier export business. A few months later, though, a jealous suitor entered stage left. In October 2001, Interbrew jumped on the bandwagon, buying a 20 percent stake in Union for itself. But Interbrew was careful to echo Lasko’s promises that there would be no takeover of Union, and that exports were the only thing on its mind--namely, to expand into markets in Southeastern Europe where Interbrew has been very active. Consistent with the beer loyalties strongly implanted in all Slovenes, some nationalist chest-thumping promptly followed. During the fierce debate that ensued among those who wanted to keep all Slovenian beer truly Slovenian, and those who thought fair business practices should be considered over nationalist urges, Lasko quietly bought an additional 12.2 percent stake in Union. What followed were some court battles, Interbrew’s complaints to the European Commission about unfair business practices, and of course, rumors about what was really going on. Lasko spent the spring and first part of the summer quietly planning its next move. On 16 July, brokers at the Ljubljana Stock Exchange doubtless experienced a bit of deja vu. Twenty-two percent of all Union shares exchanged owners in three deals that day. The air of mystery surrounding the deals was suspiciously similar to the atmosphere around 12 October 2001, when Interbrew bought the 20 percent stake in Union. But the suspense subsided in less than 24 hours when Lasko announced the details of its plans to take over Union. Lasko had purchased 21.94 percent of Union at 91,000 tolars per share (403 euros). Over the summer Lasko won its legal battles and secured the shares it had bought in the winter. With the newly acquired 22 percent stake, its ownership stake in Union was at over 46 percent. On the same day, Interbrew--which at the time owned 40.9 percent of Union--informed the Ljubljana Stock Exchange that it planned to purchase Union’s remaining shares. With this, both breweries embarked on a roller coaster ride full of legal, technical, and political dives and spins. The ride began only two days after the purchase, when Lasko was forced to slow down, having received a decree issued by the Stock Market Agency (SMA), informing it that it could buy no more shares before publishing a buy-out bid. Eventually, though, the SMA gave both Lasko and Interbrew permission to publish the takeover bid. Curiously, Interbrew offered to pay 90,000 tolars per share, which was 1,000 less than what Lasko offered. Market analysts started scratching their heads. Slovenian media, which was already having a field day with the takeover, had a new bone to chew. Among possible explanations were suggestions that Lasko might be buying Union only to sell it later. Some speculated that Lasko might turn around and sell Union to none other than Interbrew--making the so-called beer war is nothing but a carefully staged show for the media. Others have suggested that Interbrew is betting that the governmental Competition Protection Office--Slovenia’s main anti-trust agency--will not allow Lasko to take over Union. The last is a highly plausible scenario given the fact that if Lasko is successful, one brewery will cover over 90 percent of Slovenia’s beer market. There have also been suggestions that Interbrew may be repeating last year’s strategy of offering little to start with and then increasing the bid and finally exhausting Lasko. And some say Lasko is already overextending itself financially with the takeover bid. The Competition Protection Office is taking its time to figure out what to do. The director of the office, Andrej Plahutnik, claims that they are mostly taking into consideration the effects such a takeover would have on the resulting market structure, which should be defined in terms of products and not geography. The anti-trust agency is already making it difficult for Lasko to pull out of its ambitious plan. Before a Union shareholders’ meeting the week before last, it seemed that the office might not allow Lasko to use its 46 percent of Union shares to vote with or even not allow it to vote at all. At the last minute, the office decided that preventing Lasko from participating would only allow Interbrew to prevail in the vote and allowed Lasko to use 24.24 percent of its shares. Analysts say that such a move mainly served to buy the Competition Protection Office more time. The media initially dismissed the meeting as inconsequential. Nevertheless, Lasko did its best to make it newsworthy by accusing the Union leadership of nepotism. At the time this seemed like just another bone for the media. Union initially reacted calmly by agreeing to a review of its business practices, and set another shareholders’ meeting for 2 September. But then last week, Union finally made it clear that it likes the Belgian suitor better. The old fear that Lasko is trying to gain ownership only to get rid of Union in the future has now resurfaced. Lasko dismisses that, saying that should it win, it will pay special attention to make sure both brands are represented equally. It’s clear, of course, that such rhetoric is part of Lasko’s effort to sweet-talk the SMA into letting it buy Union. The Competition Protection Office recently announced that it will make a final decision on whether Lasko will be allowed to take over Union by October or November. It has plenty to keep it busy in the meantime. Aside from the consequences of the takeover for Slovenia’s domestic beverage market, it needs to decide whether or not a marriage between Lasko and Union would be good in the long run. Lasko claims that merging the two Slovenian brewers would be beneficial for the country’s competition abroad. 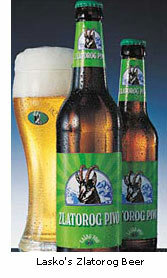 The beer giant suggests that Slovenia will need such alliances after joining the European Union and its common market. Peter Groznik, a Ph.D. candidate and lecturer at Indiana University’s Kelley School of Business, isn’t so sure that a Union-Lasko marriage would stand a much better chance in that market: “The two breweries together could still easily become a target of a global brewery conglomerate,” Groznik told TOL. Currently both Lasko and Union are focusing on Southeastern European markets, especially in the former Yugoslav republics. Interbrew won Union’s affection largely because of its promises that it would help the Slovenian brewer expand there. In June, those promises bore their first fruits when Union announced that the biggest Croatian brewery, Zagrebacka pivovara, in which Interbrew has a majority stake, is going to begin brewing Union for the Croatian market. Groznik, a Slovenian working in the United States, has seen firsthand that it can work: “If Latvians and Slovaks can sell their beer even in small towns here, I can’t see why Slovenes couldn’t do it too,” he said. Gaulthier de Biolley, Interbrew’s vice president for strategy and development, broke the “no comment” silence of the Belgian brewery on 2 August. “More than ever we are ready to reach an agreement with Lasko brewery, in which both Lasko and Union will be winners,” he said at a press conference. When surprised reporters asked him what kind of agreement he had in mind, he said he wouldn’t want to comment on that just yet. “An agreement takes two. Conditions for it are yet to be established,” he said, failing to elaborate much further on the peace offering, obviously wanting to keep Interbrew’s options open. The air of mystery around the Slovenian beer war remains thick. Some commentators are convinced that the battle for the breweries serves to show how unprepared Slovenia is for foreign business flexing its muscles in the domestic market. It will no doubt be a learning tool for what is to come with Slovenia’s accession to the EU. In the meantime, the beer battle is bound to occupy the media and market analysts alike for quite some time. Copyright © 2002 Transitions Online. All rights reserved.